Beehives are available to beekeepers in various designs, and perhaps the most popular design is the Langstroth beehive. Beehive manufacturers sell most beehives unassembled. This makes it necessary for beekeepers to know how to assemble a Langstroth beehive if it is their preferred choice. Experience in assembling a Langstroth beehive will also comes in handy when beekeepers have to put together a beehive built in any of the other two common beehive designs. Langstroth beehives are a familiar beehive found in many apiaries. With many beekeepers using them, you get a large pool of knowledge to draw from. Beekeeping clubs that you may join are sure to have beekeepers using Langstroth beehives unless they are specialty clubs. Additionally, there are many accessories and replacement parts available to beekeepers. This makes Langstroth beehives easy to use and maintain. Beekeepers assembling a Langstroth beehive have an easy time since they can get replacement parts quickly and with ease. To assemble a Langstroth beehive, you first require prior knowledge of how the hive is built. Beehives use wood as their primary material, and the Langstroth beehive is no exception. The boxes and movable frames are made of wood that is easy for bees to take to. Langstroth beehives are easy to handle and are aesthetically pleasing. Western red cedar is the preferred type of wood used in making a Langstroth beehive. It should not have any knots that could lead to cracks in the beehive structure. Langstroth beehives are loved by beekeepers because they are economical. They are well priced due to being prolific in the beekeeping industry. The space available in a Langstroth beehive gives you excellent honey yields per volume. Langstroth beehives are also loved due to their durability. They keep providing adequate space for honey bees in your apiary for years. Due to its use of wood, you may apply preservation techniques to your beehive before or after assembly. Treating the wood of a Langstroth beehive preserves it in pristine condition without rotting or weakening at the joints. Tung oil is used to provide a layer of weatherproofing for Langstroth beehives. It brings out the grain of the wood very well while waterproofing the wood. Beekeepers may prefer to paint their Langstroth beehive with a favorite color. A coat or two of primer should be applied to your beehive before painting it. Future instances of repainting are analyzed and approved based on weather exposure of individual beehives. Once it is assembled, a Langstroth beehive is expandable and interchangeable. To add more space, you only need to stack additional brood or super boxes. More brood boxes in your assembled Langstroth beehive increase space for honey bees to raise their young. Adding super boxes to a beehive gives bees more space to store honey that you later harvest. Langstroth beehives have a standard of construction with laid out dimensions. The parts may thus fit into any other hive you may have. Langstroth beehives have a few weaknesses despite their popularity. They can get heavy especially when full of honey and a colony of bees. Lifting boxes during hive inspection and honey harvesting can get tiresome for beekeepers. Of the 3 most common beehive designs, the Langstroth beehive presents the most problems with weight. This comes to the fore when you need to inspect brood boxes and have to lift off all super boxes twice: once while removing them to reach the brood boxes and once returning them on top of your Langstroth beehive brood boxes. The Honey Keeper 20 Frame Beehive Box Kit showing the different parts of a Langstroth Beehive. A Langstroth beehive is made up of a number of parts in three general sections. The top, hive boxes and bottom sections each have various components in them. Let us look at each of the major parts that are found in a standard hive from the bottom up. 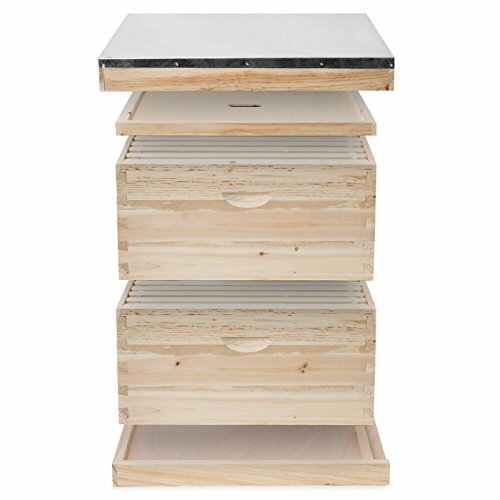 It is important to note that Langstroth beehives rest on a stand. Beekeepers use various stands to hold up the hive. These stands have features suitable to each beekeeper including ability to hold frames and elevating the beehive from the reach of predators. A hive stand also prevents moisture from seeping into the beehive which would happen with the beehive sitting on the ground. Durable stands for Langstroth beehives mostly feature plastic and metallic materials. Sitting on the stand is usually the bottom board. It makes up the floor of the Langstroth beehive. The bottom board can be either solid or screened. Screened bottom boards may allow you to check for pests easily without having to carry out a hive inspection that involves opening up the hive. It additionally facilitates better aeration of the beehive. A screened bottom board may be taken out and replaced with a solid bottom board in winter. This is because a solid bottom board enabled better heat retention in the hive. A solid bottom board prevents fire ants from gathering under the assembled Langstroth beehive. Beekeepers have the option of using an entrance reducer in their beehives. It is a piece of wood that reduces the amount of space available at the entrance of the hive. An entrance reducer contributes to hive security and can be integrated in pest and disease control. By giving bees less space to defend at the entrance, you free up workers and drones to attend to other hive activities. Any intruder entering a hive with an entrance reducer is quickly identified and easily dealt with by guard bees. As your bee colony grows in the number of bees making it up, you may increase the size of entrances so that you do not make entry and exit a hassle for them. Beekeepers may apply chemicals and treatments on the entrance reducer. Bees entering the hive brush against the entrance reducer and pick up the treatment. They then spread it into the hive. Apivars used in controlling mite infections are often used in this way in a Langstroth beehive. Once a bee is inside a Langstroth beehive, it finds itself in the brood boxes in most arrangements. Deep brood boxes serve two functions in a Langstroth beehive: they hold the eggs and larvae of honey bees and store some honey to be used as food in lean times. Deep brood boxes may be larger than other boxes in the Langstroth beehive. Large brood boxes give your bees more space to rear their young. Brood boxes used as food storage for the colony should allow the queen access. If she is not allowed to reach the food, she will die of starvation. Super beehive boxes come on top of brood boxes. A super box may be of medium depth, and is used to collect honey for harvesting. Super boxes should have the queen prevented from reaching them using a queen excluder. If the queen can access the honey supers, she will lay eggs in them and foul up your honey harvest. A queen excluder is a mesh used to allow the queen access to areas of the Langstroth beehive and deny her access to others. A queen excluder allows drones and worker bees to go through it, but not the queen bee. This is due to the queen bee being the single largest bee in a colony. Beekeepers using a queen excluder should make sure that their worker bees and drones can get through the queen excluder. If they cannot reach the super boxes, they will not be able to store honey for you in your beehive super boxes. Coming on top of the super boxes is the inner cover. It provides just the right space on top of your uppermost honey super box. The inner cover of a Langstroth beehive has the additional function of providing an avenue for ventilation of the beehive. A bee escape device may be fitted onto the inner cover’s ventilation hole to help beekeepers clear bees from their super box before harvesting honey. The inner cover of a Langstroth beehive may get attached to the uppermost super box due to bees sealing crevices with propolis. If this happens, gently prying the inner cover with your hive tool frees it from the super box. Beekeepers using Langstroth beehives generally prefer the inner cover to be sealed with propolis in place of the outer cover that comes on top of it. If the outer cover gets attached to the super box, prying it off often proves troublesome. Covering the whole assembly of a Langstroth beehive is a hive top cover. It is made to prevent direct sunlight, rain water and other weather elements from entering the beehive. Langstroth beehive top covers may be made of various materials including metal sheet. Beekeepers often favor the telescoping design of the top cover due to the fact that it overlaps the inner cover and hangs down the edges of your beehive. It clears water away from the beehive very well. A very vital component of Langstroth beehives are the frames. Each box of a beehive may have between 8 to 10 frames depending on its size, and the width of individual frames. Langstroth beehives are typically configured to hold either 8 or 0 frames. The frames hold honeycomb for honeybees to brood and store honey. You may apply foundation to Langstroth beehive frames or let bees start building comb naturally onto the frames. Advances in beekeeping have seen frames called flow frames that allow easy harvesting of honey introduced into the market. Flow frames can only be used in your Langstroth beehive’s super boxes. They are not very suitable for brooding. Langstroth beehive frames are often made of wood, though some, such as the flow frames are made of plastic. The Langstroth beehive works well with most beekeeping equipment sold to beekeepers. Langstroth beehive frames of varying sizes fit well into most honey extractors. With a Langstroth beehive, beekeepers do not need specialized equipment in their beekeeping activities. 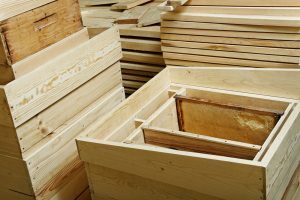 There are a few additional components that beekeepers may choose to add to a Langstroth beehive. These are not standard, but add functionality to your beehive. Beekeepers using these components may remove them during some periods of time when they are not necessary for the well being of the honeybee colony. These additional components include a bee feeder and insulation. The bee feeder is used to give additional nutrition to bees. It is placed outside the hive, preferably near the entrance. Some bee feeders may be designed to go into the beehive but, beekeepers should be cautious about moistening up the beehive too much. Insulation is used by beekeepers in very cold areas. During winter, the insulation kit goes over your Langstroth beehive and helps in keeping the overall temperature of the hive at its right levels. Beekeepers interested in having insulation for their Langstroth beehive may buy insulation kits online or at their beekeeping supplies retailers. The parts of the Langstroth beehive should be made to a standard size. The beehive boxes you use may have varying depths but the length and widths should all be the same. Having parts of different sizes will make the Langstroth beehive not stack well. Langstroth beehives are made and generally shipped with the parts unassembled. Beekeepers assembling a hive must stack the beehive together to make a complete Langstroth beehive. You also need to stack a beehive after a hive inspection. This section looks at how to stack a beehive from its constituent parts. Stacking a Langstroth beehive is easy and quick. It can be done by both amateur and professional beekeepers without the need for special tools or additional help. As you set out to stack your Langstroth beehive, first lay out all the parts at your chosen beehive location. You may use a checklist of parts to ascertain that none is missing. Langstroth beehive parts are convenient to handle during stacking. They have surfaces that can be gripped and placed even with beekeeping gloves on. The boxes used have notches cut into them to make handling easy. Beekeepers are advised to use a frame grip when working with frames that have honeycomb drawn out on them. It prevents bees from getting squashed, and is comfortable and convenient for beekeepers. The process of stacking a beehive begins by setting up the hive stand. On top of the stand comes the bottom board. The other parts of the beehive follow on top of the bottom board in order of: brood boxes, queen excluder if you are using one, super boxes, inner cover and the top cover comes last. As you place each brood or super box, insert the frames before adding the next box. Beekeepers carrying out beehive inspection should take the beehive apart in a predetermined order. Each successive part is best placed on top of the previous one. This makes it easy to stack the beehive back together easily. It also helps beekeepers avoid misplacing any parts of their Langstroth beehive. Make sure to stack all the parts of your Langstroth beehive well. All components are important in the hive. If you miss one part during beehive stacking, you leave the bee colony in the hive at risk of failure. Stacking a Langstroth beehive does not require tools or special skills. Using a standard hive tool, beekeepers very easily stack their beehives together successfully. The parts are designed to fit well into each other. You may opt to strengthen joints on individual beehive parts using suitable screws, nails or wood staples. Beekeepers should approach stacking a Langstroth beehive with courage. Once you have stacked your first beehive, you gain valuable insights into the process and you will understand your hive well. Future stacking of your beehive is easier once you have done it once. Beehive inspections that require stacking a Langstroth beehive should be done while wearing protective clothing. This is especially important if there are bees living inside the beehive. You may not need to wear protective clothing if you are assembling a new Langstroth beehive. However, if you are adding the hive to an apiary and are working in proximity to other beehives, you should strongly consider protective clothing for your own safety. Beekeepers have a wide range of beekeeping protective wear to choose from. These range from beekeeping suits that cover your whole body to jackets and smocks. A beekeeping veil and gloves complete the protective clothing you should wear while working with bees. A number of protective wear manufacturers and sellers fully satisfy your needs when it comes to choosing the beekeeping protective clothing you use. Proper assembly of a Langstroth beehive gives beekeepers the full advantages of having a well crafted beehive. It allows for easy hive inspection and honey bee colony management. Additionally, pest and disease control is relatively easy with Langstroth beehives. Mites are the greatest and most commercially significant pests of honey bees. They attach to bees and may also be found on brood in their cells. Langstroth beehives that are well assembled see mites drop to the bottom of the hive. They are then easily removed from the hive by bees or the beekeeper. If the hive has a screened bottom board, the mites will drop to the ground where they die. It is also very convenient for beekeepers to apply treatments for mites in Langstroth beehives. These are generally applied using strips or applying the treatment to the inner walls of the beehive.